Click on the image for larger version. 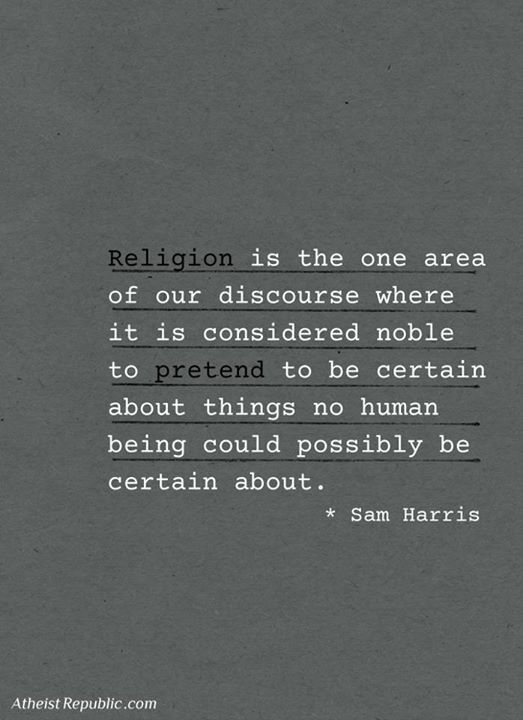 "Religion is the one area of our discourse where it is considered noble to pretend to be certain about things no human being could possibly be certain about." This is so true and I never looked at it like this. It certainly makes you think about how arrogant or perhaps blind we are too reality at times. True enough, but at least where I am, I think this attitude is changing. In the hard sciences, while we obviously wouldn't openly knock anyone's belief in the lab, theists don't really openly take pride in their religion as much as I see elsewhere - as a matter of fact they seem a touch embarrassed about it. The only time it's really mentioned, aside from jokes about busting primitive beliefs, is when it comes time for certain people to take religious holidays. Then everyone's absolutely devout and the joke is on us Atheists who end up covering their hours! Faith is something that has been over rated in so many people. It's funny to think that the one with the most faith is the one most believed by everyone else. People like to see people who express certainty, it's the feeling of certainty that helps someone sell a product or an idea the more certain the more at ease the buyer is. the more at ease the buy is the more likely they are to buy. the first step in selling an idea is selling it to yourself if you cant you may as well try and sell something else. If you like our posts, subscribe to the Atheist Republic newsletter to get exclusive content delivered weekly to your inbox. Bringing you atheist articles and building active godless communities takes hundreds of hours and resources each month. If you find any joy or stimulation at Atheist Republic, please consider becoming a Supporting Member with a recurring monthly donation of your choosing, between a cup of tea and a good dinner. Or make a one-time donation in any amount. Meet Atheists In Your City! View this meme in another language! Log in or create an account to join the discussions on the Atheist Republic forums. All proceeds will go to keeping the Atheist Republic website up and running; providing resources, advocacy, tools, community and encouragement to atheists all over the world. Record your voice here for it to be aired on the Atheist Republic Voicemails Podcast. Send us your views and opinions, your personal stories, messages of support, comments on recent news, or any comments you would like to share about your part of the world. Note : By clicking record you are allowing us to broadcast your message on any of our platforms. Links to atheist related books, shirts and movies and other atheism related products are affiliate links. All proceeds will go to keeping the Atheist Republic website up and running; providing resources, advocacy, community tools and encouragement to atheists all over the world.